Scientists at the U.S. Department of Energy's Brookhaven National Laboratory are seeking ways to synchronize the magnetic spins in nanoscale devices to build tiny yet more powerful signal-generating or receiving antennas and other electronics. Their latest work, published in Nature Communications, shows that stacked nanoscale magnetic vortices separated by an extremely thin layer of copper can be driven to operate in unison, potentially producing a powerful signal that could be put to work in a new generation of cell phones, computers, and other applications. The aim of this "spintronic" technology revolution is to harness the power of an electron's "spin," the property responsible for magnetism, rather than its negative charge. "Almost all of today's electronic technology, from the light bulb to the smartphone, involves the movement of charge," said Brookhaven physicist Javier Pulecio, lead author on the new study. "But harnessing spin could open the door for much more compact and novel types of antennas that act as spin wave emitters, signal generators -- such as the clocks that synchronize everything that goes on inside a computer -- as well as memory and logic devices." The secret to harnessing spin is to control its evolution and spin configuration. "If you grab a circular refrigerator magnet and place it under a microscope that could image electron spins, you would see the magnet has several regions called domains, where within each domain all the spins point in the same direction," explained group leader Yimei Zhu. "If you were to shrink that magnet down to a size smaller than a red blood cell, the spins inside the magnet will begin to align themselves into unique spin textures." For example, in a magnetic disc with a radius of just 500 nanometers (billionths of a meter) and a thickness of just 25 nanometers, the disc can no longer support multiple domains and the spins align in a hurricane-like rotational pattern to reduce the overall magnetic energy. The spins parallel to the disc's surface rotate around a core, much like the eye of the hurricane, either clockwise or anticlockwise. And at the core, the magnetic spins point out of the disc's surface, either up or down. So this structure, a magnetic vortex, has four possible states -- up or down paired with clockwise or anticlockwise. What's more, the core of the magnetic vortex can be moved around within a nanodisc by applying either an electric current or an external magnetic field, "so it behaves much like a particle -- a quasi-particle," Pulecio said. Applying certain high-frequency electromagnetic excitations can set the vortex core moving in a circular motion about the center of the disc. These circular motions, or oscillations, are what scientists hope to put to use. "Magnetic vortex-based oscillators can be tuned to operate at different narrowly defined frequencies, making them extremely flexible for telecommunications applications," Pulecio said. "They are also self-contained elements, about 100,000 times smaller than oscillators based on voltage instead of spin, so they could prove to be less expensive, consuming less electricity, and won't take up as much room on the device. That's especially important if you are talking about miniaturization for cell phones, wearable electronics, tablets, and so on." For now, however, the power output of these spintronic devices is relatively small compared with oscillator technologies currently in use. So scientists are exploring ways to synchronize the oscillations of multiple magnetic vortices. In the Nature Communications paper, Pulecio, Zhu, and their collaborators at the Swiss Light Source, Brookhaven's National Synchrotron Light Source, and Stony Brook University explored expanding the device in three dimensions by stacking one vortex on top of another, with the individual discs separated by a thin non-magnetic layer. They investigated how changing the thickness of the non-magnetic layer affected the fundamental interactions at the nanoscale, and how those, in turn, affected the coupled dynamics of the vortices. They directly imaged how the vortices responded to high-frequency stimulation using high-resolution Lorentz transmission electron microscopy imaging. The results: A thicker separating layer resulted in somewhat unordered motion of the coupled vortices in the two discs. The thinner the separating layer, the stronger the vortices were linked, synching up in space into coherent circular motion. 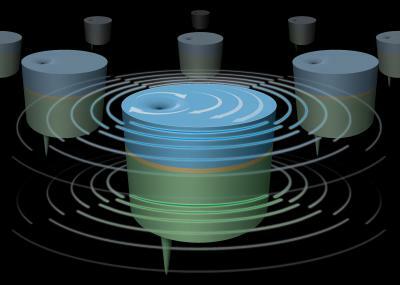 This could help to overcome the power limitations of current vortex-based spintronic antennas by creating arrays of synchronized tiny oscillators through coupled 3D stacks. The scientists are currently working with other more exotic systems to understand the dynamics in both time and space that could make spintronic technologies a reality. "Magnetic vortices were one of the first observed magnetic quasi-particles and we are currently looking to expand our investigations to observe other newly discovered spin textures and how we might harness those," Pulecio said. This research was supported by the Core-Research Programs within Basic Energy Science, DOE Office of Science. Fabrication of the devices was supported in part by the Center for Functional Nanomaterials at Brookhaven National Laboratory.